No matter the scenario, your tactical medical kit must have the equipment necessary to treat a variety of patients. And no piece of equipment is more important than your airway intervention tools are. Here, we examine the respiratory equipment you should include in your tactical medical kit. Most tactical scenarios require a rapid patient assessment. You must decide immediately whether your patient requires an advanced airway, and if the conditions support its placement. Differentiating respiratory distress from respiratory failure is key to determining the appropriate airway treatment. One of the most important airway intervention tools in your tactical medical kit is your portable suction unit. Some experts advocate for a hand-operated unit, because they are smaller and more lightweight than traditional portable units. The problem is, these hand-operated units require a rescuer to produce the negative pressure, and they are unable to handle the copious fluids associated with traumatic injury—primarily blood. 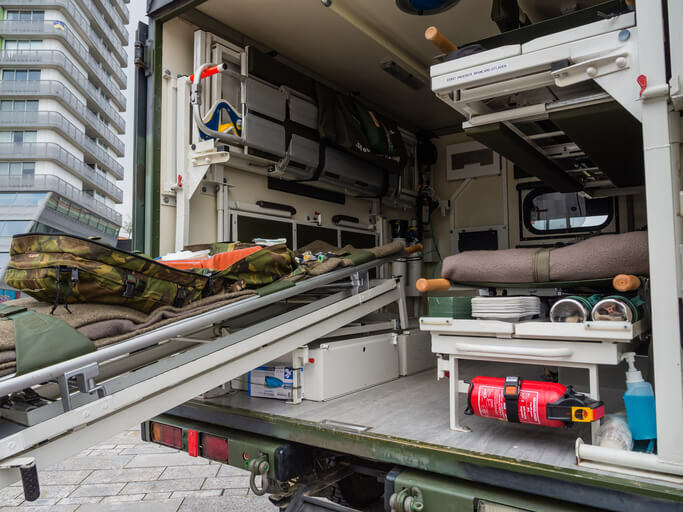 Selecting a small, lightweight unit specifically designed for tactical medicine, but operated by battery power, will provide the continuous negative pressure needed for an actively bleeding patient and free up the rescuer from pump operation. Insert the laryngoscope blade as you continue suctioning, shifting the suction catheter to the corner of the patient's mouth and to the left of the blade. Position the suction catheter tip at the proximal esophagus, so that it can continue to suction as you visualize the cords. Suction the endotracheal tube prior to ventilation to avoid contaminating the lungs. Your portable suction unit is a critical component of your tactical medical kit, so select the most appropriate and powerful unit available. Check the unit at the start of each shift, to ensure the batteries are fully charged and operational. Have backups available—not only batteries, but backup suction units, as well, for MCI response. Disinfect after each use with a bleach solution, even if it appears there is nothing in the tubing or canister. Disinfect all outer surfaces, such as control knobs, screens, and handles. Discard biohazards in appropriate containers and never reuse disposable parts. Your tactical medical kit must be equipped to handle a variety of medical emergencies, the most obvious being traumatic injuries. Your first objective is securing a patent airway. Suction plays a vital role in tactical treatment, so be sure your unit is up to the task.